OpsCenter monitoring provides multiple features to proactively prevent disk space issues. Sufficient disk space is necessary for restoring backups successfully. Before downloading a snapshot from a destination to use for a restore, OpsCenter (as of version 6.0.9 or later) verifies whether each node has sufficient disk space required for the download. The disk space check looks up the partition for the agent tmp_dir and verifies there is sufficient space on that partition. If necessary, change the agent download directory using tmp_dir in address.yaml. Attempting a restore to a location with insufficient disk space fails. The Restore Report indicates which nodes do not have sufficient space and how much space is necessary on each for a successful restore. Tip: When creating a backup, the Create Backup dialog dynamically displays the size of the selected data to back up in the Current Data Size field. 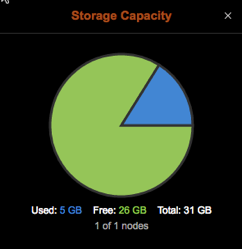 Monitor free disk space for backups and restores by observing the Storage Capacity widget in the Dashboard. 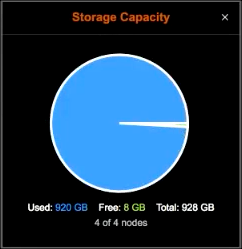 The Storage Capacity widget is enabled by default in the Dashboard. When storage capacity becomes limited, add capacity or clear space as necessary. Note: Monitoring disk space for restoring backups assumes the tmp_dir resides on the same partition as the backup data. Tip: Keep abreast of capacity requirements using the Capacity Service. See Forecasting. Add the Free Disk Space alert to notify you when free disk space goes below an acceptable threshold for an environment. Click Alerts > Advanced > System > System Free Disk Space from the Notify me when menu. You could also set up a Used Disk Space (GB) alert. Note: Alerting about disk space for restoring backups assumes the tmp_dir resides on the same partition as the backup data.